A million dreams that’s all it will take to make the world that we’re going to make. 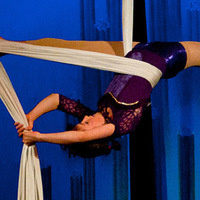 The Empyrean Aerialists will fly into your dreams and capture your hearts as they tell a story about you. The feeling we would all like to embrace to fly, to love, to feel the power of the ‘GREATEST SHOW ON EARTH’. This show is about you. Acrobats, dancers, and aerialist climb to extraordinary heights while tumbling through the air effortlessly to inspire your fantasy to fly and your dream to be in a circus.The story begins when Sara, a homeless beggar, watches the world as she extends her hand, wanting food or money, just to stay alive. Every day a tall man drops one penny into her hand and walks away. Her life changes when he reaches down to her hand as part of his daily gesture, but rather than giving his daily penny he embraces her hand. She withdraws in nervous trepidation. He reaches into her eyes with his confident and warm stare asking at the same time would you like to join the circus. An unimaginable life for her was about to begin. Welcome to the Greatest Show on Earth. Le Cirque Centre's professional performance company 'The Empyrean Aerialists' have trained extensively in dance, aerial circus and theater to become professional performers.The members of the company are selected carefully by the director, Lorenzo SantaBarbara, on the basis of their professional amplitude as dancers, aerialists, acrobats and physical actors. The company has performed in Los Angeles at the Ramone C Cortines Performing Arts High School, the Craterian Theater in Medford Oregon and Seattle's annual arts Festival Bumbershoot.